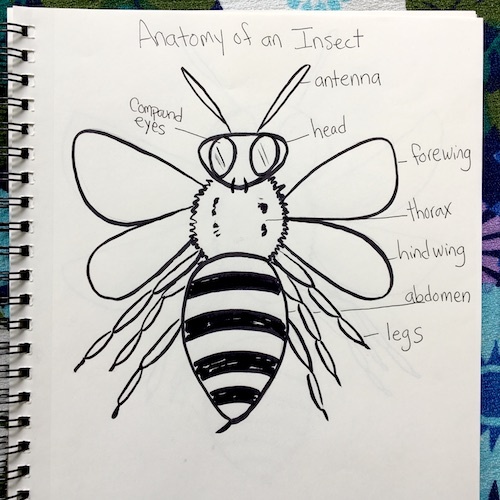 I had such fun teaching an insect anatomy nature journal class last week, that I thought what a great Wonder Wednesday project! Not to mention why not celebrate all the awesome summer insects flying around these days? Cicadas, dragonflies, butterflies, beetles, even mosquitoes – insects are cool! The neat part of anatomy – in most cases – is that if you learn the anatomy of a family you an draw any species within it. I love that – obviously, since it’s stuck with me this long! 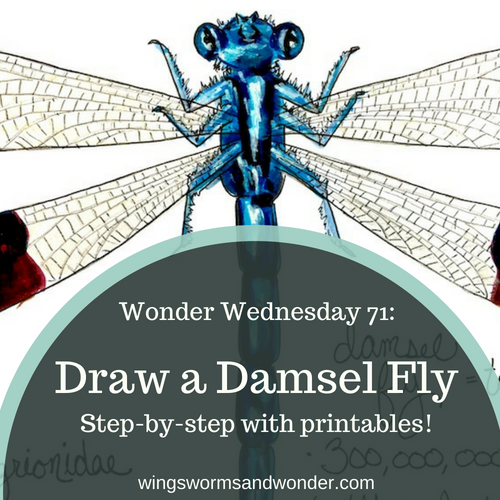 In this activity we look at a bee, and then step-by-step draw a damsel fly. Which, for the record, is neither a small dragonfly nor only female. I love damsel flies because they make me think of overnight canoe camping trips I used to take at camp on the James River in VA back when I was a teenager. 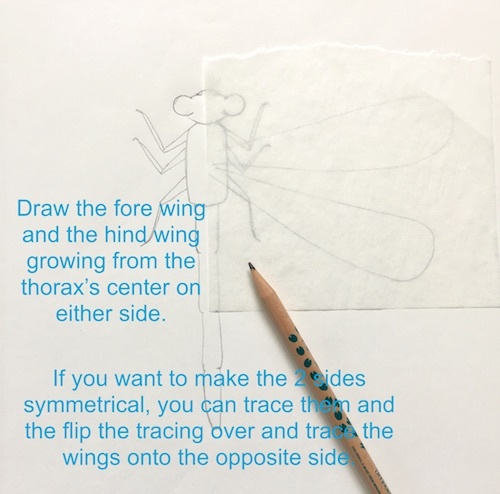 Once you learn to draw the parts and pieces of insect anatomy in this activity, go draw your own favorite summer insect! First, take a look at this diagram of a bee. These parts are present in every insect. They are what makes an insect an insect. But they may look different or be various sizes in various insects – remember what the anatomy teacher said? For example, dragon and damsel flies have very tiny antennae that don’t even extend past the front of their heads. Unlike butterflies who have much longer antennae. 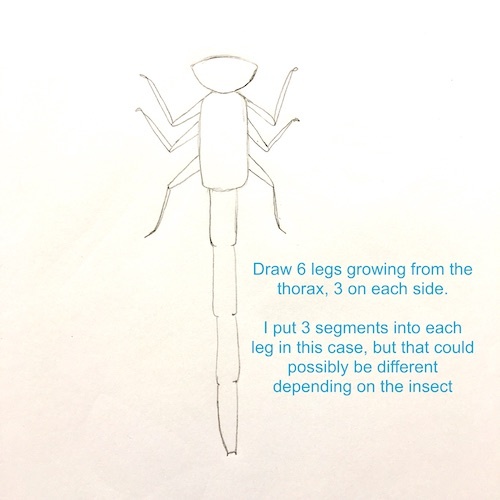 If you like, print out this diagram (from the link in Seeds to Sprout) to trace and label the parts of an insect. 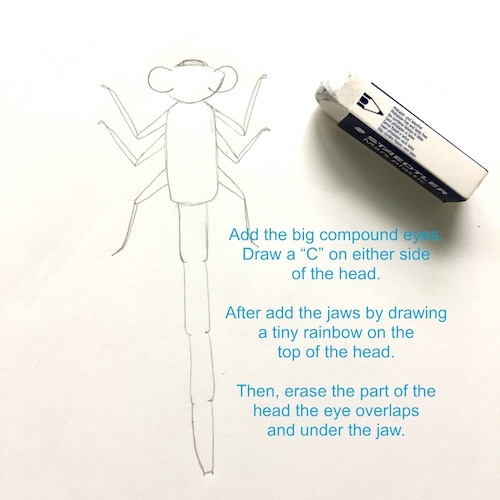 Now for the damsel fly – step by step! 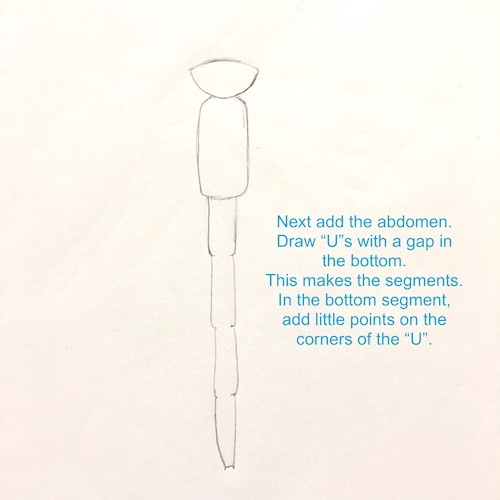 Draw along with me, or you can print out a body outline from the link in the Seeds to Sprout to trace – or do both! Insects have compound eyes, which is like looking through a kaleidoscope all the time. That is so super crazy right? Damsel and dragon flies have over 25,000 ommatidia (aka science for the little eyes that make up a compound eye) in each compound eye!! Each collects one bit of visual information, to form a mosaic image in the insect’s brain. Fun fact – Did you know that the reason dragon and damsel fly wings are iridescent is because there is a thin layer of liquid between 2 clear layers that shines in the sun while the insect is alive. 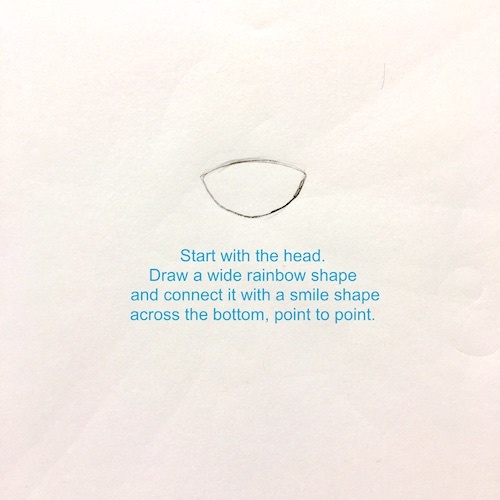 Finish here, trace in ink, or keep going and add color! Remember to add in the tiny antennae here if you are finished. I added mine in marker below. 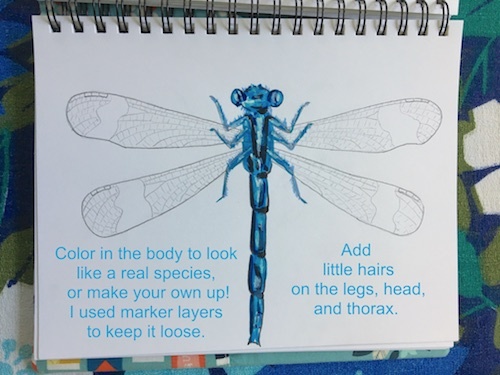 Look at references to discover colors for damsel fly bodies, or make up your own! Or do like I did here for fun and combine 2 types. Here I liked the body of the Civil Bluet & the wings of the Megaloprepus. I wanted this to feel a little wild, so I used marker because I know I am my most loose when I use marker. I first colored in the solid part of the wings with marker. 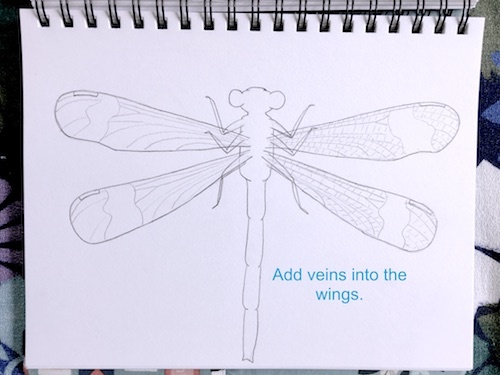 Then, I traced the body, wings, veins, and added the antennae in Pigma Micron pen. I added white highlights with paint pen. 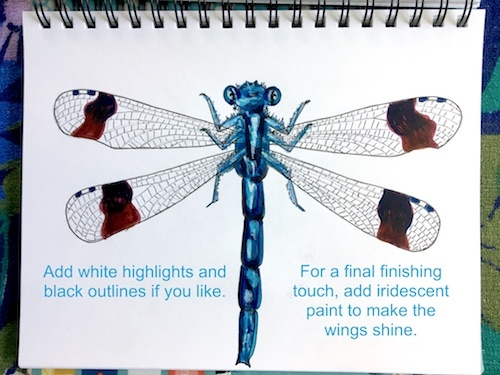 Finally, I went over the clear part of the wings with iridescent watercolor medium to make them shine. Add the zoological name and some details if you like. 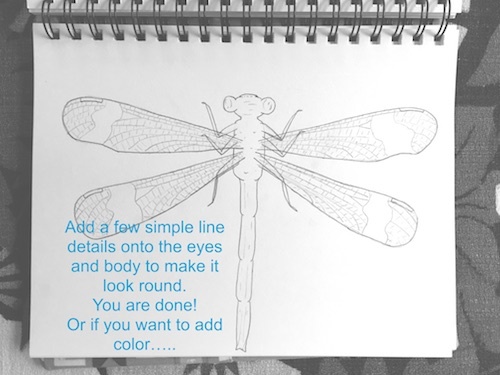 Now go have some fun with drawing insects! Did you have fun with this and live in or near North Florida? 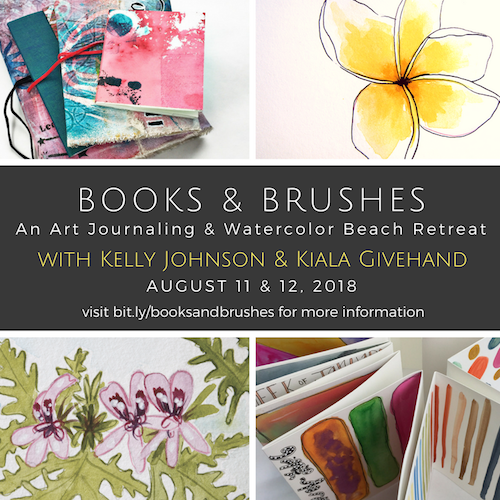 Maybe join my upcoming weekend art retreat Books & Brushes! We’ll spend a day and half making are and connecting with nature! Check it out here. 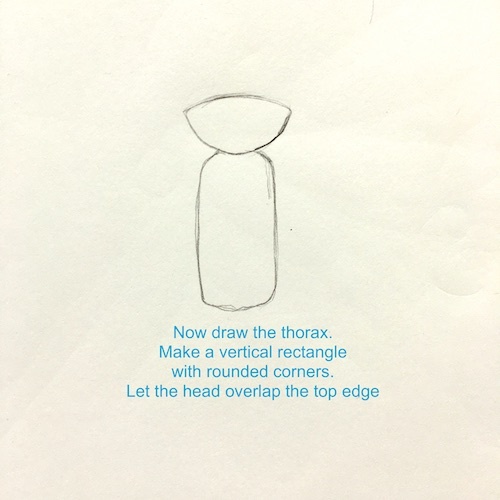 Don’t live in my area, but want more nature drawing fun? 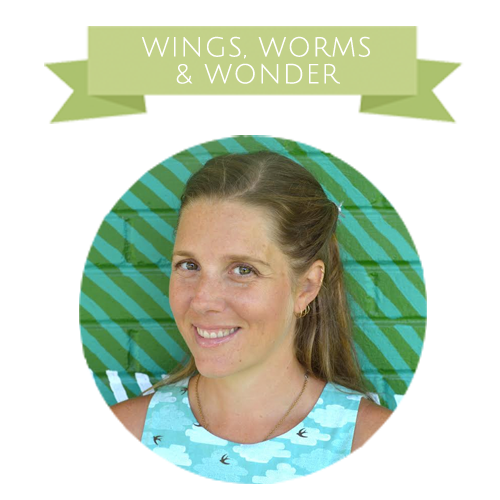 Check out my online nature journaling school and classes here! 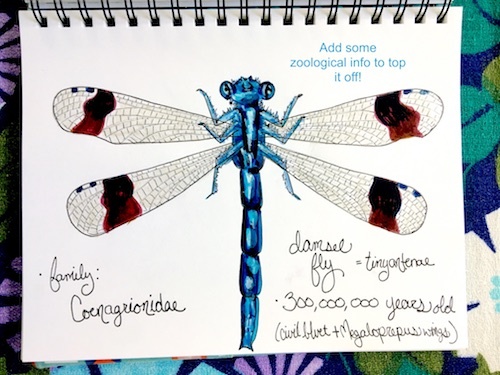 Want an awesome nature art journal reference for insects? 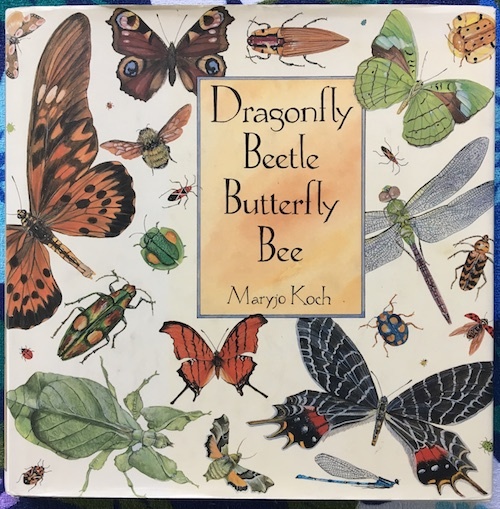 Check out the book Dragon, Beetle, Butterfly, Bee by Maryjo Koch. I got this book 20 years ago and love it just as much as the first day! 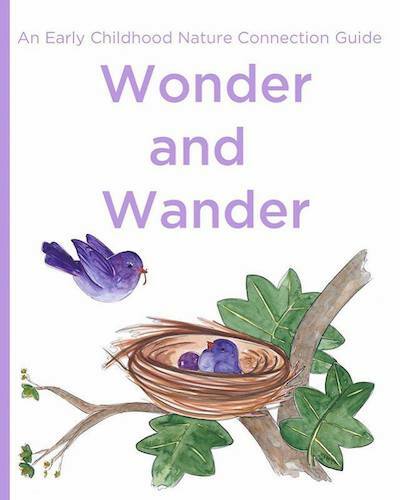 Get the youngest humans connecting with nature with the help of Wonder & Wander! Snag your copy here!